Very cute, very easy and very homemade No Sew Valentine’s Day Card! 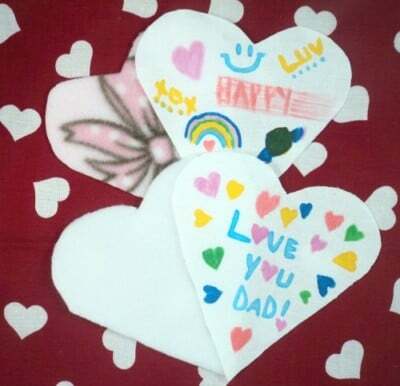 Turn a few pieces of scrap fleece and fabric into a personalized Valentine’s Day card which works for all age groups to draw and appreciate. This is a fun DIY for kids and what a great craft project for grandparents to help grandchildren create a homemade Valentine’s card for their parents. As a bonus this is a No Sew DIY and I am always pro glue gun for crafts! Draw a heart by hand or on a computer graphics program to fit in a 5″ by 5″ square. I have included my 5″ by 5′ template here to download if needed. 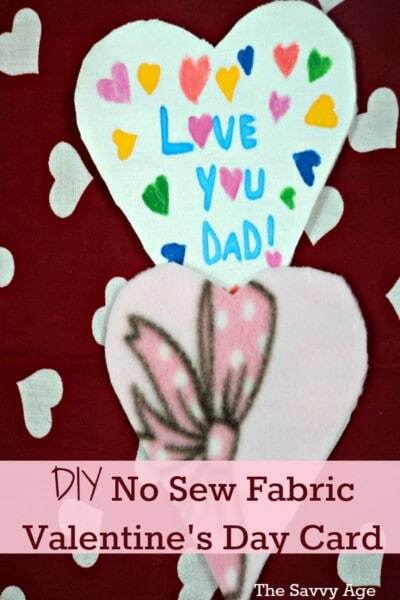 Cut out the heart to use as a template for the freezer paper, white fabric and fleece fabric. An easy to use free online graphics program is picmonkey and hearts are included as a template. Trace the heart on the white fabric square. The white fabric heart will be the card. Cut out a 6″ by 6″ square of freezer paper. Write a Valentine’s Day sentiment or draw a picture or do both with your fabric markers on your handmade Valentine’s Day card. After the heart is finished remove the freezer paper and cut out the heart from the white fabric square. If desired keep the freezer paper and store in your craft stash as it is reusable. Using the heart as a template, trace the heart on the fleece fabric and cut the fleece heart out of the fabric. Place the white heart drawing side up on top of the fleece heart. 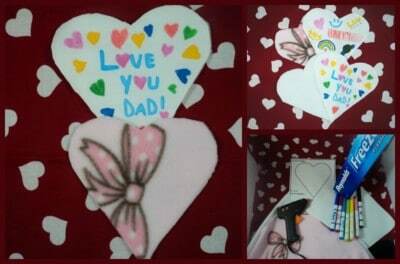 Glue the edges with your glue by placing the glue gun between the hearts and quickly dab with glue. Smooth the edges of the completed heart with your fingers and removed any loose stray glue strands. The white fabric does not need to be a good quality. Simple white cotton fabric works best. Any kind of fleece or fabric can be used for the backing, I prefer fleece as it adds body to the back of the card and is easy to glue. The freezer paper can be an optional step. The freezer paper adds stability to the white square so the fabric does not move when drawing and protects the table from any bleed through of the markers. Generally the fabric markers do not bleed through the fabric – but- very yong artists tend to use a heavy hand with markers so better safe than sorry. An alternative is to put a disposable plastic tablecloth on the table and tape the fabric square to the tablecloth. Day Four: DIY Valentine’s Day Button Vase – Dollar Store! It’s a fun and easy DIY!